Ah, 1993. Tom Hanks was Sleepless in Seattle, Spielberg made dinosaurs roar again, while a young Will Smith was making us ‘Boom, Shake the Room!’ The year River Phoenix checked out was also a year of world-shaking firsts: Cigar-enthusiast Bill Clinton arrived in the oval office, One Direction were born, and ballsy producer Roland Joffe, best known as director of The Killing Fields, struck a deal with Nintendo, securing the rights to the very first Hollywood videogame adaptation. Memorial Day weekend saw the arrival in theatres of Super Mario Bros., a picture that confounded audience expectations, going down as one of the biggest, most perplexing cinematic duds of all time. So began Tinseltown’s rocky love affair with the weird world of pixels, polygons, platforms and power-ups. 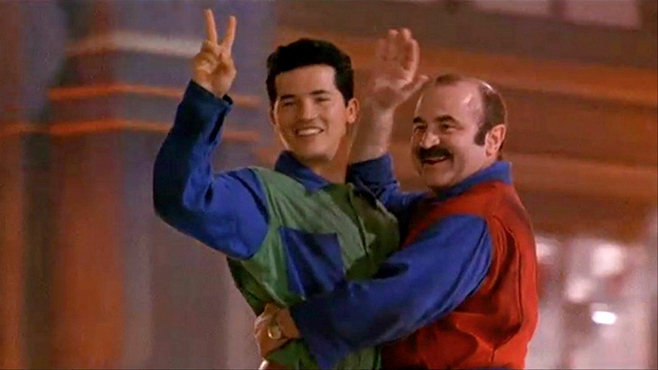 Super Mario Bros. star Bob Hoskins has repeatedly claimed that making the film was the worst mistake of his career, and coming from someone who was in both Spice World and Son of the Mask, this is quite a statement. 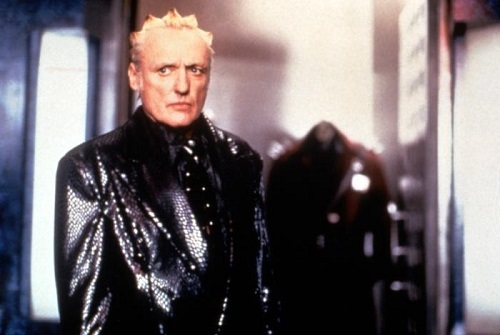 Directed by husband-and-wife team Annabel Jankel and Rocky Morton, creators of satirical science fiction TV show Max Headroom, Super Mario’s journey to the big screen was turbulent. 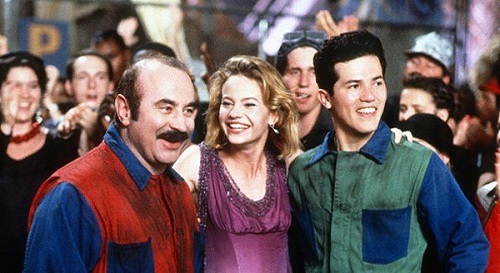 Suffering various re-writes and a troubled shoot ballooning $25million over budget, John Leguizamo, the Luigi to Hoskins’ Mario, has admitted that the pair would often turn up on set drunk just to get through the day. Opening the same day as Jurassic Park, and blighted by unanimous critical condemnation, Super Mario Bros. failed to recoup even half of its bloated production costs and effectively sank without a trace. It looked like any hopes Mario had of hitting the ‘Continue’ button for another cinematic adventure were lost forever, yet in Summer 2013, 20 years since its release, it was announced that he would finally get a sequel – albeit in comic book form. In the two decades since its release, the film has steadily built up a dedicated cult following amongst gaming fans. Two such enthusiasts were writers Steven Applebaum and Ryan Hoss who, with the blessing of original movie writer Parker Bennett, took their love of the film to the next level by creating their own free web comic book sequel, which is currently turning heads online right now. 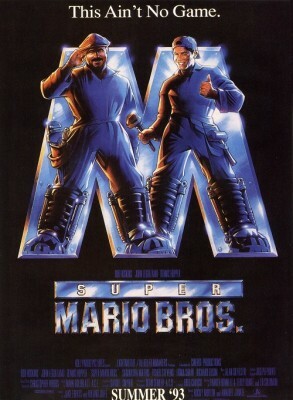 With Mario receiving a game-changing One Up that nobody saw coming, what better time to revisit the first video game movie ever made? Super Mario Bros.’ script problems are evident from the off, with a shoddily animated opening segment explaining that the asteroid that hit Earth 65million years ago didn’t actually kill the dinosaurs, but sent them to a parallel dimension where they evolved into humanoid reptile people. It’s a neat concept, and a clever way of explaining the largely plotless, lizard filled world of the Mario games, but the segment seems slapdash and cheap, narrated by an irritating Brooklyn-accented wiseguy who thankfully never surfaces again. As the titular hapless plumbers who find themselves transported to this mind-bending ‘Dinohattan’, Hoskins and Leguizamo have great chemistry and make for a formidable comedy double act, but are far from convincing as ‘brothers’ considering their 22 year age gap. Consummate professional Hoskins delivers the cheesy ‘See ya later, alligator!’ dialogue with conviction, while Leguizamo radiates goofiness complemented by a loveably naïve charm. His dopey Luigi looks completely stoned throughout, so the revelation that he was rat-arsed for most of the shoot is no huge surprise. Broken Arrow’s Samantha Mathis, too, is spunky and affable as spirited princess in peril Daisy, but the real draw here is Dennis Hopper, revelling in the OTT role of reptilian villain King Koopa. Hopper has a riot in full-on Blue Velvet scenery-devouring mode, as the manic, snarling mudbath-adoring antagonist looking to merge the two dimensions for some unexplained odious purpose. Though often reduced to gurning like a cartoon character, bellowing piss-poor dialogue like ‘I’ll get that plumbbeeeeerrrrrr!’, Hopper’s enthusiasm is cheesily infectious. Though bearing little resemblance to the Mario games, the film is gorgeously realised, with its dark, Bladerunner inspired future-punk Dinohattan sets, all twisted metal, steam and neon. Cinematographer Dean Semler gives the film a real baroque visual sensibility, making Koopa’s kingdom a dark, sinister place, reminiscent of Labyrinth and Return to Oz, other family films with a dark edge. 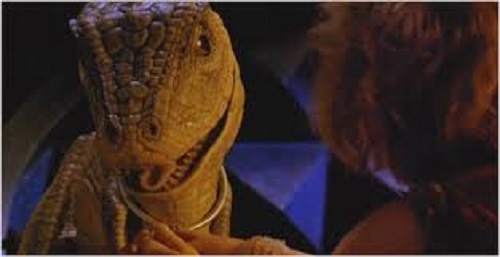 The special effects impress too, with some decent CGI and remarkable animatronics bringing Daisy’s dinosaur sidekick Yoshi to life – in the year of Jurassic Park, Mario’s striking thunder lizards more than hold their own. 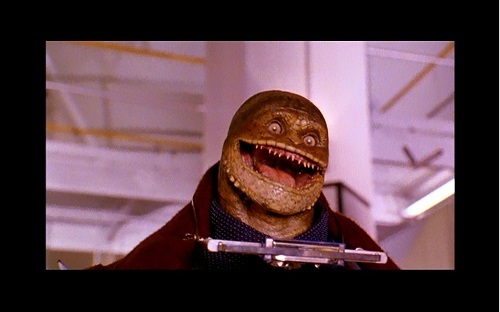 The effects work on Koopa’s tiny-headed lizard minions, the Goombas, are also impressive, and though their look is markedly different to the games, they provide the film with some of its more riotous moments, including an elevator-set dance sequence that really tickles the ribs. Jet-powered jump boot ‘stompers’ also provide a thrilling, creative, visually memorable way of bringing Mario’s super-powered jumping skills to life. Super Mario is rough around the edges, pure fantasy codswallop, but it’s also fast, rarely dull, and is as silly as you could want a film based on a videogame to be. It’s a brave picture and though very kiddy-friendly, it’s jam-packed with creative ideas, high concept and ridiculous costumes, reminiscent of another forgotten classic, Masters of the Universe. It’s far from perfect, of course, as evidenced by a chase sequence that sees our heroes slaloming through a network of icy, frozen pipes. The zippy, rockin’ musical score infers that this scene is supposed to be thrilling, but no amount of fancy editing and incendiary guitar licks can disguise the fact that they are travelling at about 2mph. Also, the clunky, searching-desperately-for-a-pun ‘trust the fungus’ dialogue is hellish at times, the plot is never properly explained and the film seems to be lacking one big final money-shot set piece crescendo that never materialises, as though the money simply ran out. Previous Post Trevor Phillips: The Perfect Embodiment of GTA?